It’s that time of year again, Easter basket time! For a while, to be honest, I was a little against Easter baskets. It felt almost like Valentine’s day to me. Easter is a time of rejoicing and celebrating our risen savior, not bunnies and baskets and eggs filled with sugar. But, eventually, the excitement got to me and I figured it was all in fun, we definitely teach our kids about the meaning of Easter (well, right now, the 5 year old), and I decided I was being an Easter scrooge. Today I’m getting in the spirit with some cute and easy DIY bunny baskets. I’m not super big into going all out for Easter gift giving. I want my boys to enjoy a special treat, yes, but I also want them to know the true meaning behind the holiday. So I try to find as many deals as I can and here’s what I came up with this year! Now this is the wee one’s first Easter and he’s still very young so, instead of not doing anything at all, I went super simple and cutesie. It’s a veggie and bunny basket! Some veggie and fruit squeeze pouches and a stuffed bunny from the Dollar Tree make for an easy yet adorable presentation. Big brother definitely got a little more since he’s older, of course, and he understands, to the degree that a 4 year old can, what this holiday is about. It also helps that he goes to a Christian preschool. For his basket, I wanted something that he could use throughout the year, not just Easter. Party City has these great little buckets and he loves putting his cars and trinkets in different containers. Plus, it’s Blaze so, BONUS POINTS! Party City is also where I got the Paw Patrol cup and washcloth (more useful things that he enjoys) and he loves the little popping candies and soccer chocolates. For fun, I found a Melissa and Doug reusable sticker pad at Five Below that I knew he’d go crazy over. Then it came time for the spiritual gift. For a while, I had been doing a devotional with Gav that he had received as a gift a few years back. He was too young for it then but this year I thought we could start it. Not to say anything bad about a devotional, but I thought this particular one was way to adult in content. The wording was too mature for a 4 year old, in my opinion, so I’ve been on the look out for a new one. I found this great one, it’s cover is holographic so that’s why it looks a little blurry, and I purchased it from Amazon. Last but not least, I know I’m not the only parent who cringes at the sight of Easter grass! Simple tissue paper that I already had did the trick perfectly. Green for “grass” in Ro’s crate and red to match Gav’s bucket. Total cost for Easter 2016? About $36! Not too shabby for this frugal mama! This will be the first year that we’re giving Mr. G an Easter basket that from us. We haven’t in the past because he was about 3 months old for his first one and the second and third ones were given to him my grandparents. Now, we didn’t know that they would be giving him one, but I felt that he had no real idea what Easter really was and, to me, it’s not really a gift giving holiday. So I’m not very big on the giant gift baskets, or special toys for Easter, and don’t get me started on Easter grass. If you are, that’s wonderful! But for us, I like to keep the focus on the true meaning of Easter and I also like to work with a smaller budget. So today I’m sharing with you the Easter basket that I’ve put together for Mr. G that involves minimal candy, no Easter grass, and still has the message of Easter in it. Step #1 – Go to the Dollar Store! Not only can you find a great basket for next to nothing, you would not believe the great little things you can find there! I mean at this age, anything you give them will be played with pretty hard, may as well get a good deal on it. They even have little prayer books. This stuff is great for the filler. Boys stuff, girls stuff, and a good portion of it is non-food. Step #2 – Head over to a Target or Walmart. Need more? Didn’t quite find what you’re looking for at the Dollar Store? They have a entirely different selection of goodies for awesome prices, a lot of which is about $3 or less. Target is where the basket is from and it was only $1.50! Now I will say that they have much more fabulous baskets than the traditional woven ones (like the fabulous one I found with the cutest fabric lining but I knew that it was more for me and $12 so I couldn’t justify it!). But I stuck with this one because it is green, Mr. G’s favorite color, small, and can definitely be reused. Step #3 – Find that special Easter message item. Like I said, the Dollar Stores near us here in Georgia have small prayer board books that are perfect and super inexpensive. However, with Mr. G being 3 and in a Christian preschool, I felt like he was ready for more than that. He’s learning about Jesus and how great he is and I thought he deserved a special book. Book fair to the rescue! There was a Lifeway Christian Book fair at his school this week and I found the perfect one! This was the only “splurge” item I purchased. And by “splurge”, I mean $6.99. Not too shabby, under $20, and I know Mr. G will love it all! I can’t wait to give it to him! What’s in your Easter Basket this year? Calling All Bloggers & Shop Owners! I loved doing this DIY. It’s simple, cute, and I already had everything I needed! And this definitely doesn’t have to be just an Easter project, there are endless options. But it does make a super cute Easter egg! I also love that this can definitely be a family project. Easy for the littles and an adorable piece of holiday decor when you’re finished! I’ve been wanting to try an ombre mani for awhile but never wanted to buy five different shades of the same color. So I waited until I had somewhat of the same color family and started experimenting. It’s not too difficult, you just have to be patient. Mix your colors by adding alternating layers of polish until you reach your desired color. Make sure you don’t let it dry until you reach your color. 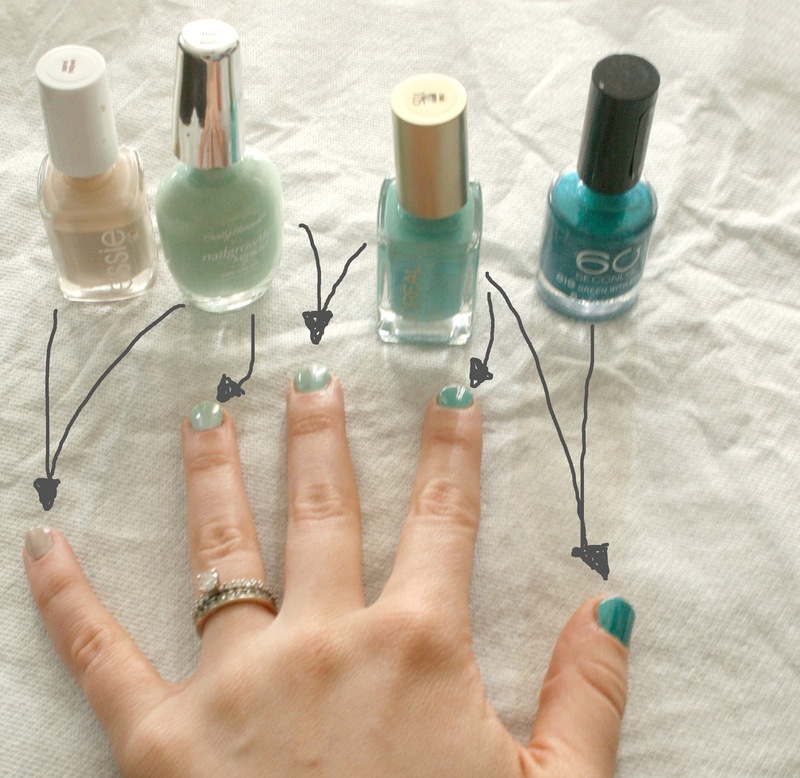 In between the mixed color nails, do a solid color. I gave my nails a matte finish to look like dyed Easter egg shells! I love NYC Matte finish top coat!